For this outfit, I chose it the previous night after watching the NBA playoffs. The player whose jersey I am wearing, John Wall, had a great game and won as well. 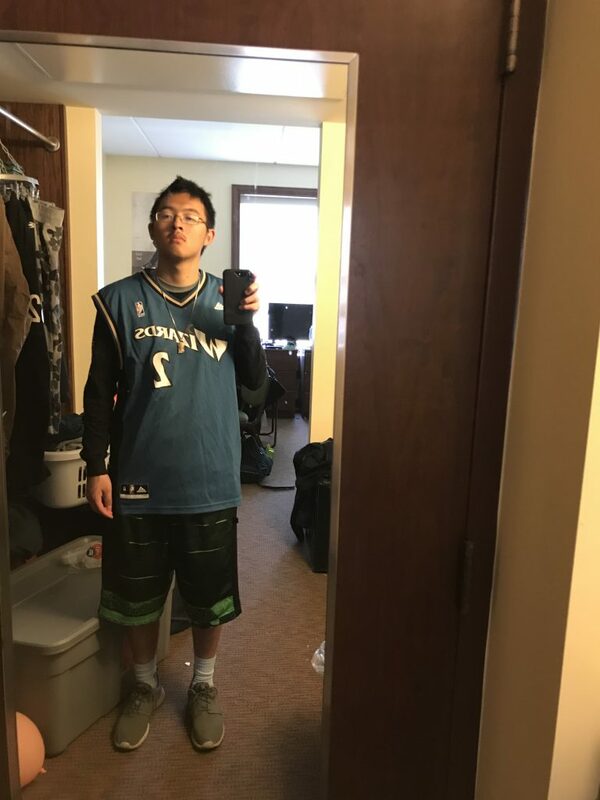 So in honor of him, I decided to rep the old school jersey in order to give a stylish look. Since it was a little chilly in the morning, I wore a Jordan long sleeve shirt underneath. The black works well with the blue of the jersey. For the bottoms, I chose to wear a pair of green Jordan shorts. They are very comfortable. While they are baggy, this is a style of short that I often to pear with a throwback jersey. For the socks and shoes, they are both Nike. The socks are Nike Elite socks, which are comfortable to wear for sports and casual wear. The shoes are Nike Roshe Ones, which are casual shoe as well. The whole outfit is a blue/green mix of colors that works well together. That’s so convenient that you had the jersey of a player from the winning team! I assume it’s because you’re a real fan. It’s so supportive to wear the merchandise from your teams, and helps promote them! It really is a great throwback look that helps sports teams know they’re doing it for the fans.